In the last few decades, China has recorded an unprecedented growth in higher education in terms of enrollment (system capacity) and enrollment rate (enrollment relative to age cohort). In light of Trow’s definition of three-stage higher education development (Trow, 1973), China’s higher education system has experienced a transformation from elite to a mass form within a short period. The growing opportunities in higher education may increase the quality of the population and their life chances. However, the same process has also created challenges in the continued development of higher education, particularly when such a rapid expansion outstrips the ability of institutions to maintain the quality of higher education. Setting out against the policy context of Chinese higher education going through the process of massification, this chapter critically examines the strategies that the Chinese government has adopted to assert its global leadership in higher education. With particular reference to changing university governance, this chapter focuses on the major measures that the Chinese government has adopted (1) in developing a “world-class university” and (2) in the recruitment/attraction of overseas talent for employment in the country. The following discussion begins with the transformation of governance strategies in managing universities against the context of intensified global competition, followed by the examination of major schemes in building world-class universities and attracting global talent to assert global leadership in higher education. The final part of the chapter discusses the changing university governance and implications for educational development as well as the strategies/measures recently adopted by the Chinese government to transform its universities. Mok, K. H., & Jiang, J. (2017). 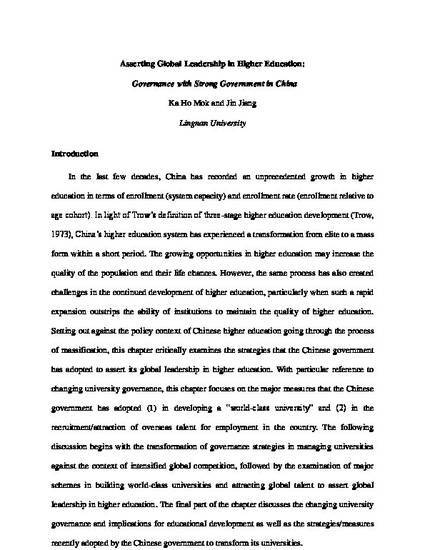 Asserting global leadership in higher education: Governance with strong government in China. Unpublished Manuscript.